If you visit the Net-a-Porter website as often as I do, you’ve probably already seen these Christian Louboutin Puglia 100 wedges. And if you’ve already seen these shoes, then you’ve probably been expecting to see them turn up here sooner rather than later: well, far be it for me to disappoint you, so here they are! These are everything I love in a wedge. 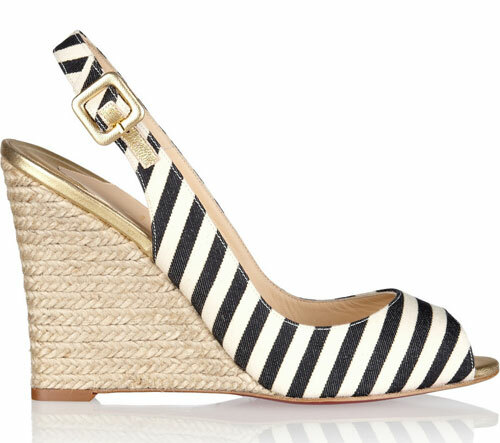 In this case, the stripe upper has a very nautical feel, which is picked up by the rope effect on the wedge heel. To add a luxe feel, and help set these apart from all of the numerous other pairs of canvas wedges that are released every summer, however, Louboutin has added some touches of gold on the buckle, and on the insole, which I really like: I’m a fan of metallics in general, but while many people reserve them for evening wear, I always find gold very summery, so it’s a great choice for a shoe like this. With all of that gushing over, however, I have to just add that as much as I like these shoes, even I wouldn’t pay $595 for a pair of canvas wedges. They definitely look gorgeous, but the canvas/rope combination isn’t nearly hard-wearing enough for me to be able to justify spending quite that much on them. I seem to buy canvas wedges every summer, and then want to replace them the next year, because they’re one of my favourite types of shoes for warm weather, and they never quite survive the season without showing some signs of wear, unfortunately. I’m not convinced an expensive pair would fare any better than the cheaper ones I usually buy, so sorry, Christian Louboutin, but I will just have to admire these from afar! Buy Christian Louboutin Puglia 100 wedges here. Love love LOVE them! But I wouldn’t pay that much either.